Darryl Sydor. Jaroslav Modry. Randy Jones. Jake Muzzin. For Kings fans, these have been some of the more popular “whipping boys” over the years. In hindsight, however, we fans are often guilty of focusing too much on one individual within what is a 5-on-5 sport. And sometimes, we learn that we were just plain wrong about some of these guys. Sydor went on to become an integral part of two Stanley Cup champions. From 2001-06, Modry racked up 150 points, 16th among all defensemen, and an emotional All-Star Game appearance. Advanced stats show that Muzzin is a puck-possession monster. Jones…well, everybody was right about Jones. For this year’s Kings, Muzzin is not the droid you should be looking for. Slava Voynov is the defenseman who will swing LA’s playoff hopes. The conclusion you must draw from these numbers? Drew Doughty is awesome. Beyond that, you might notice Muzzin just barely scraping Los Angeles’s top-four this season (beating out Robyn Regehr by just eight seconds a game). In fact, he’s hardly on the PK (00:31/SH TOI/G as of 3/14/14). Muzzin is the team’s offensive specialist (2:34/PP TOI/G) in much the same way that Regehr is its defensive specialist (2:53/SH TOI/G, 0:04/PP TOI/G). So think about LA’s defensive minute-munchers since 2012. Scuderi is gone. Mitchell seems to have lost a step. Muzzin and Regehr are specialists. 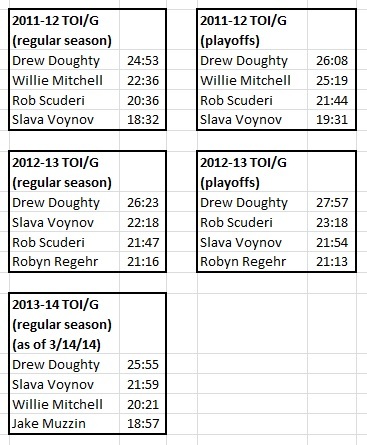 Doughty is a god, but even gods can only play half a game. This past summer, Voynov was given a six-year, $25 million dollar contract. It’s not enough that he once helped the Kings win a Cup. That was two years ago with more sheltered minutes, and back then, he was just competing with Jack Johnson’s defensive ghost. Now, he has to be as good as Scuderi or Mitchell circa 2012. Now, after Doughty, he’s the team’s second-highest paid and second-most used defender. This Spring, will Voynov be able to stand up to the Patrick Kanes and Ryan Getzlafs when Doughty’s a-sitting? While far from shouldering the blame, he failed to stop the best of the best in Sochi. But that reminds me about focusing too much on one player in a team sport. Nevertheless, as some Kings fans chronicle “Muzz’s Mishaps and Triumphs” in the coming months, I’m going to watch #26 just a little more closely.